Mallorca is the largest of the Spanish Balearic islands in the Mediterranean. All our villas are located in the beautiful north eastern area of the island – beautiful beaches, unspoilt countryside, wonderful views, old historic towns as well as bustling holiday resorts make this area of Mallorca very special. There is something for everyone here! The 20km drive from Peurto de Pollensa to the tip of the wild Formentor Peninsular is a must for all visitors to Mallorca. BUT either go early (before 11am) or after 4pm as the road can get busy with the tourist excursion coaches. The road climbs out of Peurto Pollensa to the Mirador des Colomer – a short walk up opens up fabulous views of the peninsular with its 1300 foot high vertical cliffs. Further on down the road is the Playa Formentor – a beautiful stretch of sandy beach right by the famous Formentor hotel. The road carries on in a series of hairpin beds and tunnels to the light house on the tip of the peninsular. The views are stunning – 500 feet straight down to the sea – and on a clear day views over to Menorca. 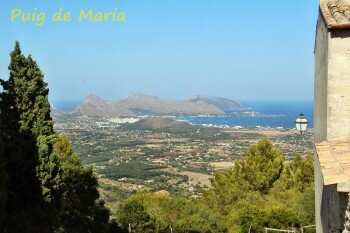 Lluc is about a 45 minute drive from Pollensa along the MA10 road. 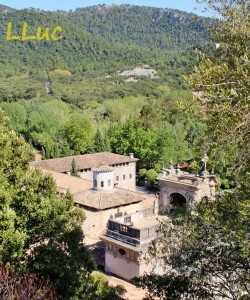 The monastery at Lluc is Mallorca's most sacred site. Situated in the Tramuntana mountains Lluc has been a pilgrimage since the 1200's when according to legend a shepherd boy discovered a dark wooden statue of the Virgin Mary. Wander round the grounds, in to the buildings, there are outdoor park areas for children to play, bars and restaurants to relax in! For the energetic a walk up and round the Moorish ruined Castle of Alaro is a must! 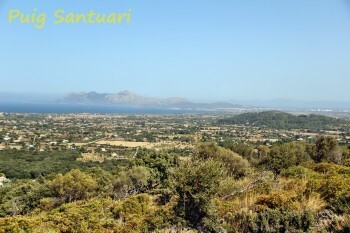 The views over the Mallorcan plains and Palma to the south an wonderful. You can drive most of the way up to Es Verger (narrow, pot holed and hairpin bends) – the bar/restaurant is a step back in time and a wonderful place to relax and soak up the views. The actual castle is a about a 45 minute walk further on. This is a 1 hour train journey from the island's capital – Palma to Soller. The narrow gauge line dates back to 1903 and hasn't changed much since then – the engines and carriages are still original. The 27km route goes across the plains of Mallorca before ascending then descending its way through the Tramuntana mountains via a series of switch backs, bridges and 13 tunnels. Once in Soller (the Orange capital of the Island) you can take a tram down to Port de Soller – the ten minute journey costs 2 euros. Mallorca is a fascinating Island with plenty to do and see for everyone. With each villa booking we send you a detailed road map of Mallorca as well as fully inclusive guide book. Puig de Maria is just south of Pollensa on the other side of the MA2200 main road. A steep single track road winds up the hillside – for the brave who drive up there is some parking where the road ends. From here another 10 to 15 minutes brings you out at the summit and the Satuari de la Mare de Deu des Puig – with it's wonderful Gothic chapel – small bar and stunning views over Pollensa, Puerto Pollensa and Alcudia. Just across the valley from Puig de Maria, Puig Santuari is a short 15 minute walk up through scented pines – at the top there is a new viewing platform which looks over the Bay of Pollensa.